George Lathrop hangs out in the stage left equipment room of the INB Performing Arts Center. In this city, there aren't many backstage areas George Lathrop can't get into. He effortlessly buzzes into a Spokane Arena or INB Performing Arts Center discreet side door; his name is the equivalent of "open sesame." These are places he's helped with lighting and staging for decades, even designing the lighting and draping systems for the Arena. Last Friday, he's showing off the LED lighting system he designed for the Davenport Grand Hotel's largest conference room, a brand new, mostly red space that seemingly extends half a block. Everything is constructed to make installing extra lighting and projectors for conferences and luncheons easy, even for those who haven't worked on professional stage crews for 40 years. There was a time when he liked the idea of the roadie experience. It was the '70s and the thrill of a fresh town every other night while rubbing shoulders with famous people screamed of adventure. He had friends who went on the road. But then Lathrop, a then-hippie who had just graduated from Eastern Washington University with a drama degree — a major he'd switched to after realizing the theater department had far better parties than the biology kids — recognized that he appreciated his family too much. "I like to go home and sleep in my own bed," says the father of five. "And with being a roadie, one of the constants is talking about which wife you're on now, also drinking. It's not conducive to healthy relationships." Lathrop never did go on the road full time; instead he toiled as a stagehand for all of the theaters in town, working essentially as a roadie, just rooted in one place. His first gig was hauling equipment for a Spokane Symphony concert, which led to getting on the stagehand call list for Expo '74. Through the years he did less of the backbreaking work and more on the consultation and design side of things. 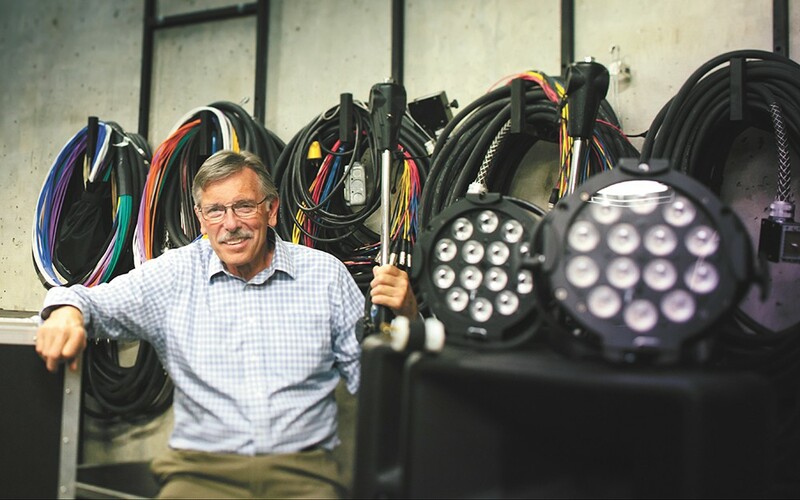 He opened up his own company, eventually called Silhouette Lights & Staging, in Spokane in the early '80s. These days, even after recently selling his business to focus solely on consulting, he still manages the backstage production of most huge shows coming through the Spokane Arena and some at the INB Performing Arts Center. He arrives an hour before call just to touch base with the incoming acts' stage manager and confirm that everything is in place. For a huge show like the Eagles, who sold out the Arena in May, he expects nearly 20 trucks coming in for one night of entertainment. "We had about 96 stage guys come in for that one," Lathrop recalls. Those would be the union stagehands, usually from Local 93 of IATSE, the International Alliance of Theatrical Stage Employees, which has had a Spokane chapter for more than 110 years. Workers arrive around 8 am, check in with Lathrop and are sorted into crews: drivers, electricians, riggers, carpenters and more. "I'm just the old guy that sits in the back room that says, 'No, you're not going to make it like that,' and 'You can't plug that many lights into a circuit.' I'm a counselor," the 66-year-old jokes. These men and women do this part time, but for $32 an hour (the going rate for rigging) it's well worth it for someone willing to sweat profusely from every pore for at least four hours. And Lathrop is proud of how effective and professional his crews are, before and after shows. "Stage managers and roadies see our place as a break on the tour," he says. "In a place like Chicago, the big arenas are trying to make money, but we're here to help you set up. We impress people with how quickly we get things set up and torn down." After seeing so many concerts, musicals, ballets and more, Lathrop admits he's jaded, that he isn't impressed easily by the talent. There were, of course, the times he ran shows for Willie Nelson, Johnny Cash and Waylon Jennings. And in the early years of the Festival at Sandpoint, Carl Perkins called out from the stage that the lighting guy really knew what he was doing. These are moments he won't forget, and these music choices well reflect the self-appointed cowboy, who owns about 40 acres near Cheney where he's raised cattle, pigs and chickens with his wife, Leslie. Standing in the enormous hotel conference room, he talks about how far the music and entertainment scenes have come. He'd like to see more theaters in general, more places for live shows, but he's still impressed.